Pingdom is a popular website testing platform and we often recommend Pingdom's free tools to WPX users for testing the speed of their websites. 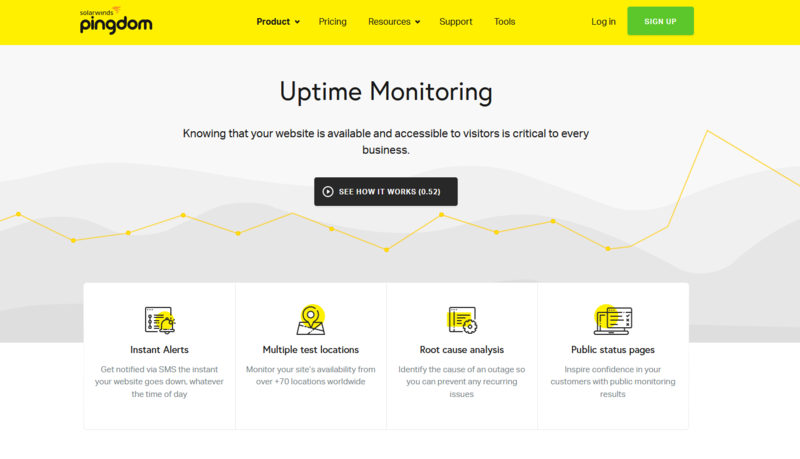 Pingdom’s premium Uptime Monitoring tool has been causing some issues recently and may be reporting false positive downtime results. Due to how Pingdom operates, it is possible that the first test result may not work correctly and thus give a false positive downtime report when testing your website. Pingdom can produce a downtime result if the target website does not load within 30 seconds. This problem can arise because Pingdom is often hampered by high site traffic and can (in rare cases) potentially be blocked by DDoS Protection (like you have on your site)! Pingdom’s own servers may even be running slow at the time; these factors can result in Pingdom having difficulty accessing the target website within 30 seconds, and thus a false downtime report appears. Even if Pingdom takes 31 seconds to load your website, it will consider your site as ‘down’. As with many online testing tools, we recommend that you don’t rely on the very first result and wait between 5 and 15 minutes before starting another test. Test results from the second, third, fourth, etc tests will be more accurate. You could even try testing your website using another online resource, like Uptime Robot. If Pingdom gives you a downtime result from your test, please wait a moment and re-test your site. Chances are your site will load fine the next time! Read also about Matthew Woodward's recent study (see all the results here). Find out more about our New Zealand WordPress hosting here (we have a new CDN end point in Auckland too).